But Lolie, born on the island shortly after the shipwreck, will find in the legends of this desolate land and the fantastical forces that spring from its mysterious secrets, the power to rid this world of the injustice and intolerance that have plagued it for so long. 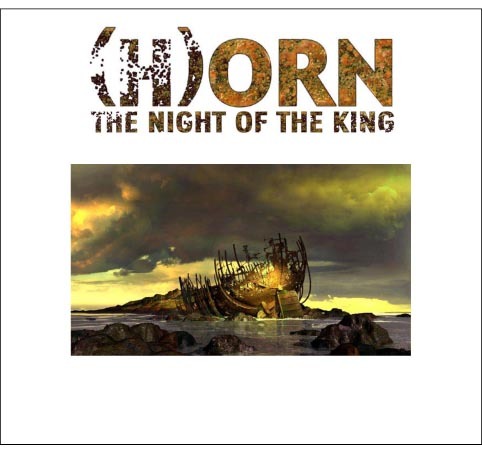 “(H)ORN – The Night of the King” is a fable for adults and children. It will eventually be the forces of “good” that will attempt to save LOLIE and APOLLO. Thanks to their imaginative and resourceful characters, these two children find the will and strength necessary to defend a noble cause: the overthrow of Orn. LOLIE becomes the instigator of this heroic resolution… She will be helped in her task by two forces sprung from the world of Fantasy : ARGONE-BIRD, the falcon come from nowhere, bringing with her the riddles that Lolie will have to unravel in order to discover the origin of all conflict… and ARGONE, the true legend, the one that constitutes the myth of the island, reincarnated from the past in the form of the bird. From the three characters of LOLIE, ARGONE and the BIRD, it will often be difficult to know which point of view the CAMERA will take… And the originality of this project rests on this visual artifice. …a vain ambition when we know that LOVE will always triumph… But in this case, its flame cannot ignite without the intervention of Apollo with his innocent spirit and vivid imagination. 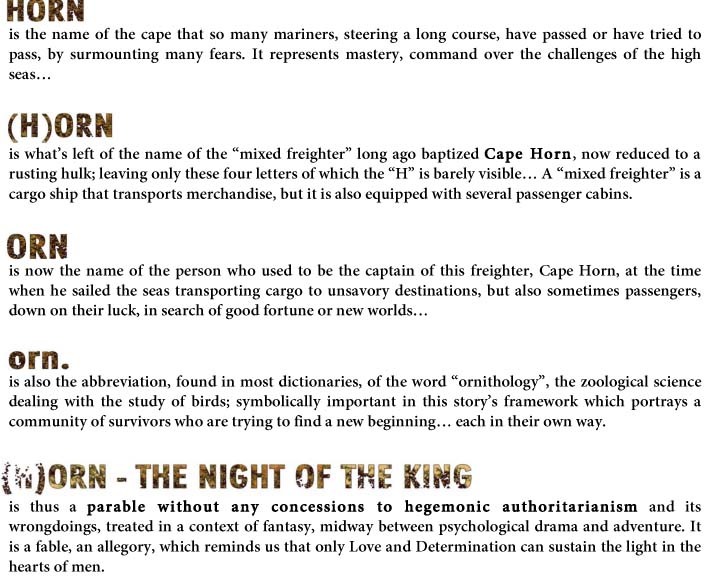 “(H)ORN – The Night of the King” is a story of Adventure and Fantasy where the pure kindness of children infiltrates the black heart of despotism and its intolerance in an isolated setting rich with archetypal myths.